Mansion Casino is powered by downloadable and non-downloadable Playtech software. Register a new account here and you will automatically qualify for a $/€/£5,000 welcome bonus (all games are included when claiming this bonus). The $/€/£5000 is actually classed as a high roller bonus. Regular players (low rollers) can benefit from a 100% matching deposit bonus worth $/€/£500. Plenty of other fantastic promotional offers are also up for grabs here. Players can contact the customer support 24 hours per day via Email, Chat (live chat), or by telephone, which is toll free support from most countries: UK: 0800-376-8375, Australia: 1-800-606-729 and Canada: 1-866-966-2452. This trustworthy online casino can be displayed in multiple different languages, it is licensed Gibraltar and it is owned by Mansion (Gibraltar) Limited. There are more than 200 different games for you to check out here. They also now have a Live Dealer Casino platform and the main game categories include New Games, Slots, Table Games, Card Games, Live Casino, Jackpot Games, Casual Games, Scratch Cards and Video Poker. They also have a fantastic range of Marvel themed slots such as The Incredible Hulk, Blade, X-Men, Ghost Rider, Thor – The Mighty Avenger, Iron Man, Iron Man 2, Fantastic Four, Daredevil and more. These Marvel slots are all connected to the same Marvel Multi-level Progressive Jackpot, but you can also keep an eye out for other popular jackpot games such as Bonus Bears, Watt St Fever, Diamond Valley, Mega Jacks, Gladiator Jackpot, Beach Life, Gold Rally and Queen of the Pyramids. More than 50 million download clicks have been made here at Mansion Casino. The download client contains more than 200 different online casino games and frequent real cash players can take advantage of a fantastic VIP Members Club. Popular online casino methods that are accepted here include Visa, Visa Electron, MasterCard, ECO, Maestro, Solo, Ukash, NETELLER, Sofort, Envoy, giropay, iDeal and Skrill/moneybookers. 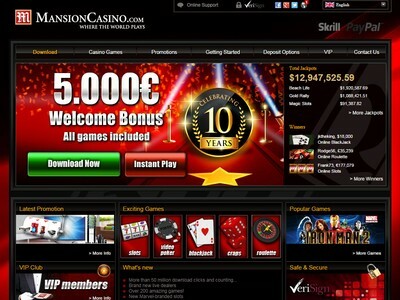 Mansion Casino is often recognised as one of the top UK online casino sites. Frequent casino bonuses are up for grabs for registered members and some of the Mansion Casino 'big winners' include Frank73 who won €177,079 while playing on the slots, Rodge56 won £35,239 playing roulette and player jktheking won $18,000 while playing Blackjack.